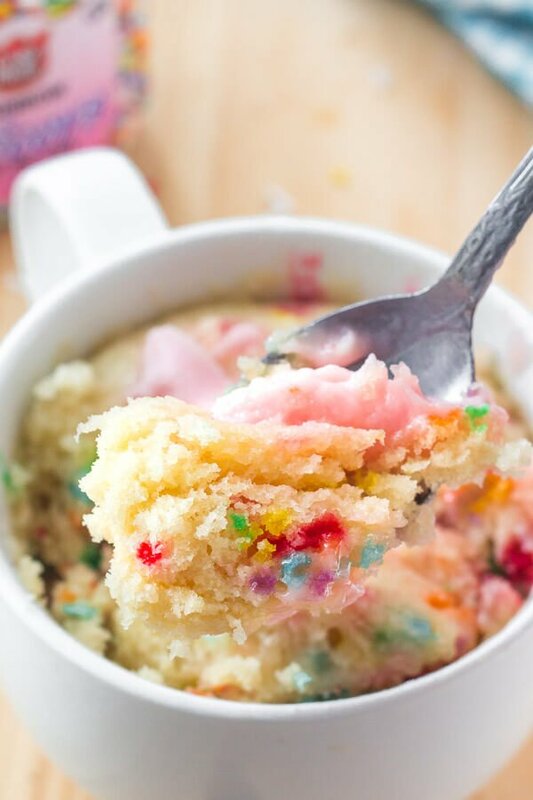 This easy vanilla mug cake is made in the microwave and ready in minutes! It’s moist, with a delicious vanilla flavor and tons of sprinkles. When the craving hits for a delicious treat and you need it pronto, this vanilla mug cake is here for you. It’s moist, filled with vanilla goodness, and ready in minutes. Plus – it tastes delicious with a scoop of ice cream and tons of sprinkles. I know what you’re probably thinking – don’t you always have cake around the house Fiona???? Sadly the answer is no. As much as I bake, I try to give away as much as possible (after taste testing of course), and schedule baking for the blog around having company over or occasions when I need to bring dessert. So despite how much I bake – typically on a Friday night at 9 pm there aren’t any treats in my house. Which got me thinking about mug cakes. What’s a mug cake you ask??? 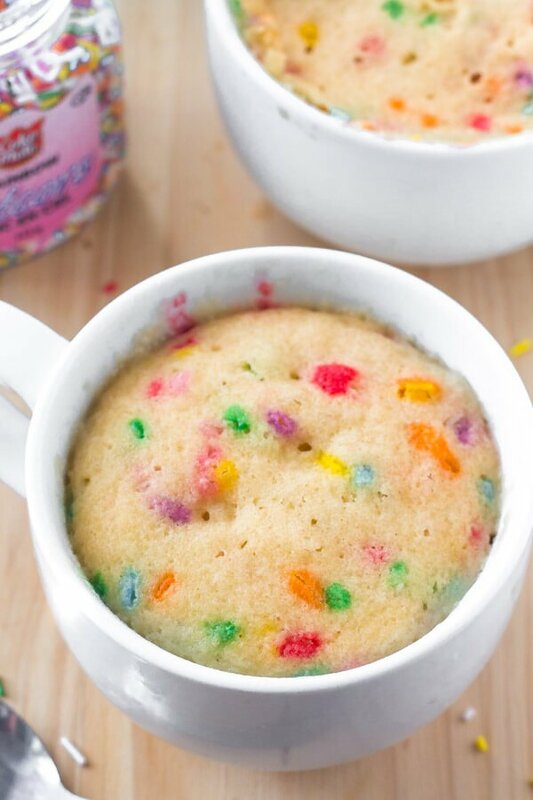 A mug cake is a single serving cake baked in the microwave. All the ingredients are mixed together inside of a mug, and then it cooks in the microwave for about 1 minutes. There are really endless varieties and flavors – but today we’re making a vanilla mug cake. Ok – let’s talk specifics about this delicious vanilla mug cake. 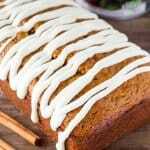 What I love about this recipe is that it’s moist, flavorful and definitely still tastes like cake even despite the fact it’s made in the microwave. We’re using real butter for lots of flavor, and vanilla extract for the perfect vanilla flavor. Then milk keeps in moist (dairy free milk works too) and juuust the right amount of flour so that it doesn’t taste dry. 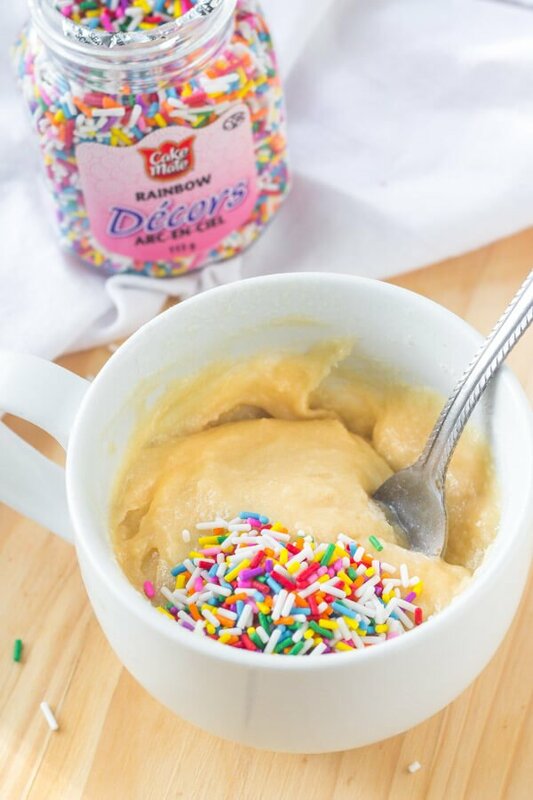 You can add a few sprinkles to you vanilla mug cake and turn it into a delicious funfetti creation. It bakes in the microwave for about 1 minute. The cake will rise quite a bit as it bakes, so make sure your mug isn’t too small. Just be careful not to overbake, otherwise, it can turn a bit dry. I typically eat mine straight from the mug (just make sure to let it cool for a minute or two first), or you can also gently scoop it out of the mug and serve on a plate. A scoop of vanilla ice cream on top is super delicious, or you can also add just a little frosting. 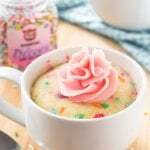 This vanilla mug cake is such a delicious treat when you’re home alone, or craving something sweet in a jiffy. 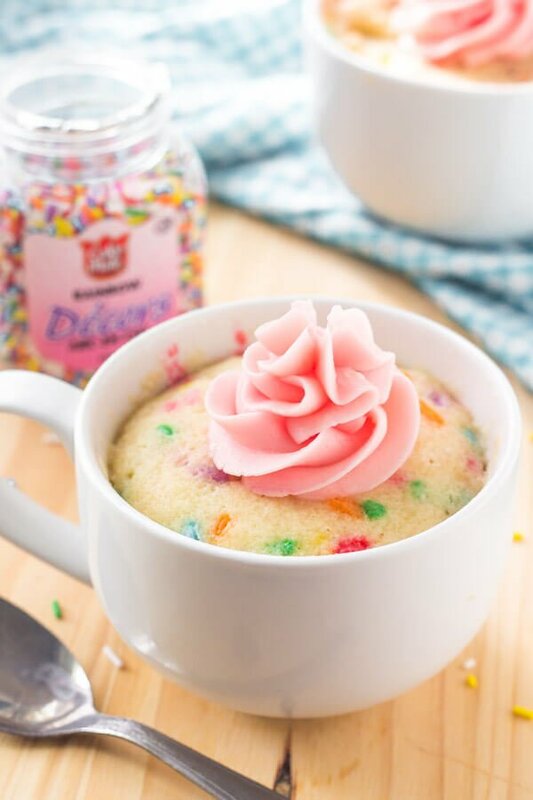 This easy vanilla mug cake is made in the microwave and ready in minutes! It's moist, with a delicious vanilla flavor and tons of sprinkles. Add the butter to your mug and microwave until melted. Whisk in the milk, vanilla extract, egg yolk & sugar with a fork. Then whisk in the flour and baking powder. Stir in the sprinkles. Microwave for 1 minute. The top should look set when it's done. Cool for at least 1 minute before enjoying. 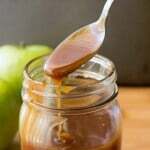 Beat the butter using an electric mixer or whisk with a fork until smooth. Bea/whisk in the powdered sugar 1 tablespoon at a time until the desired sweetness is reached. Then beat/whisk in the milk. Spread/pipe on top of the cake. Learn how to make Perfect Cookies Every Time! In this FREE email series, I'll send you 5 classic cookie recipes along with ALL my tips & tricks. The cake baked like magic! I will definitely try this with my kids! My only comment is that I think you went too heavy on the butter in the frosting. Does it work with salted butter? This was so good!!! I made it for Breakfast it was light and airy and supper moist I Definitely will be making this every day!!! This amazes me every time. Today is the first time though making just the straight cake. I made microwave grapefruit curd the other day, and I need something to sop it up! Previously I used this recipe to make an apple cake. I make the batter as instructed above and dump it on top of a peeled, chopped apple, sprinkled with brown sugar and a little cinnamon, which is microwaved for a minute or two to soften the apple. It takes longer to bake once assembled – I believe it’s close to 3 minutes. I cook the mixture for 1 minute, then in 30 second increments till the cake is cooked through. The time may be bowl size dependent, because I do that in a widish bowl and it basically cooks from the outer edge, with the center finishing last. My cake is now cooled enough – the cold grapefruit curd will do the rest – so I am off for brekkies. Thanks! I was unclear – I make the apple mixture in the bowl the whole thing will get cooked in, then mix the batter in a separate bowl and pour it on top of the cooked apple. Loved by all the family. I used self raising flour and it was perfect. I want to start by saying I’m 25 Weeks pregnant and was dying for a sweet treat at 2AM. This was so easy and really tasty! I topped with lemon curd and vanilla frosting. I will definitely be making this again! Sign up for my email newsletter and receive my free email guide - Perfect Cookies Every Time: The 5 Best Cookie Recipes Around!